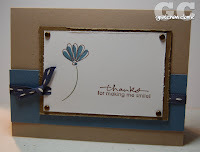 I pulled this card out of my stash, I was just not in the stamping mood last night. I did have good intentions, but just couldn't get my stamping mojo on, probably since I was so tired after my Wednesday. I ran a ton of errands before work, then after work Mike and I visited someone from our church who needed a listening ear, then went to pick up Mike's car from the shop ($620 OUCH!). Luckily Mike decided to grab some dinner from Chipotle(one of our favorite places), and bring it home, and can you believe that when we pulled in the driveway the "service engine soon" light came back on in Mike's car (Arghhh!). After chowing down we watched American Idol. And called it a night. I hope your Thursday is Terrific! I am so ready for Friday!